The New England Basketball Hall of Fame recognizes people from the region whose excellence has contributed to the rich legacy of the sport. This past weekend, Liza Janssen Petra '94 was inducted as a member of the 2015 Hall of Fame class. "I am more than humbled to be included with so many of basketball's greatest players and coaches," said Janssen Petra of her selection. "I carry great love for the game and reflect fondly on days of hard work at practices, amazing victories, and even the most devastating defeats at Wellesley. It is wonderful to have the opportunity to relive those moments through this recognition, which I gratefully accept on behalf of my Wellesley teammates, coaches and athletics department." 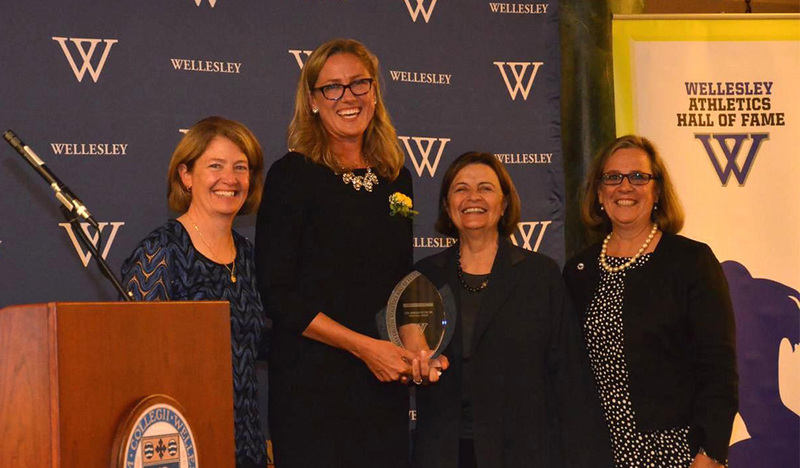 Janssen Petra, who was also inducted into the Wellesley Athletics Hall of Fame as a member of the inaugural class in 2014, was a nationally recognized force during her four-year basketball career at Wellesley. She helped turn the program from an 8-15 record to an 18-6 record by her final season, winning two Seven Sisters Championships in the process. She was a two-time Kodak National Basketball All-American (1993, 1994), winner of the New England Women's and Men's Athletic Conference (NEWMAC) Player of the Year award in 1993, and also earned ECAC and New England Player of the Year accolades following the 1993-94 season. Janssen Petra ended her basketball career with 1,739 points, including six games with over 30 points. In 1993, she was named an NCAA Division III Offensive Player of the Week and Seven Sisters Tournament MVP while leading the division in blocked shots. During her final season she led all of Division III in rebounds with 388. Janssen Petra is currently the Alumna Co-Chair of Wellesley Friends of Athletics. She has served on the committee since 2010 and has been instrumental in the continued growth of Wellesley athletics and recreation.